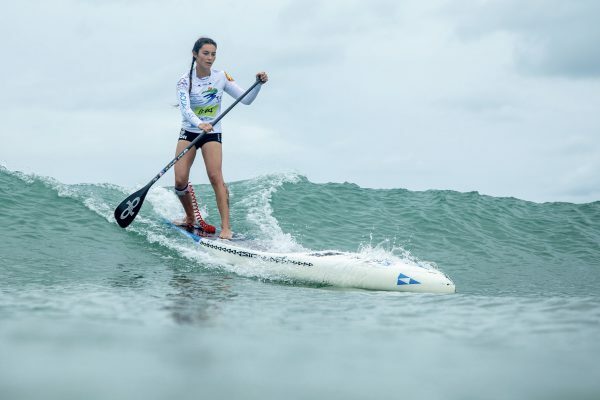 Jade Howson, of Laguna Beach, ferociously paddled through the tropical waters off Hainan island in China earlier this month to win the title of world champion in the girls U-18 division at the International Surf Association’s World SUP and Paddleboard Championship. The 16-year-old represented the United States in a stand-up paddleboard race against 12 other girls under the age of 18. Despite the uncomfortable humidity, Howson maintained her lead throughout the duration of the race, beating the runner-up by 28 seconds. 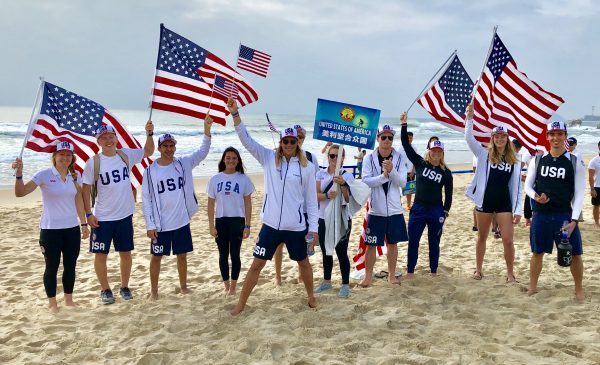 Howson was handed an American flag as she hit the sand and draped it around her shoulders as she ran into the arms of her mom, Kris Howson, and competitive paddling friend, Fiona Wylde. This was the first time that the championship included a race just for girls. In previous years, it’s included women and girls of all ages who can qualify. Howson said she appreciated the opportunity to meet other girls from around the world who share the same passion for competitive paddling. Howson represented the United States in a stand-up paddleboard race against 12 other girls under the age of 18 and won, becoming the U-18 world champ. Photo courtesy of the International Surfing Association. Howson also competed in the women’s sprint race and took the bronze, the same prize she won while competing last year in the Paddleboard World Championship in Copenhagen. One memory that stands out for Howson from her trip to China was trying to get her 12-foot-long paddleboard on her connecting flight from Beijing to Hainan. After pleading with an airline employee who didn’t speak English, Howson and her mom were asked to run three and a half miles through the Beijing Airport to load her paddleboard onto the plane and then run back to their gate. Howson’s dad, Robert Howson, owner of Harbour Surfboards, passed on his love for surfing and ocean to his daughter from the time she was a baby. Harbour Surfboards learned to surf in Hawaii when she was just 4 years old. Howson said even when it’s cold and raining, she finds beauty in being on the ocean. She’s enjoyed the peace of paddling during the colorful sunsets in recent weeks. To get in championship-winning shape, Howson spends more of the year training three to four days a week on the water and two to three days in the gym. Howson credits her paddling coach Mike Eisert of The Paddle Academy with helping her push through the physical and mental challenges that come with competitive paddling. Although the heat and humidity in Hainan didn’t affect Howson’s physical ability, she admits that it wore on her mind’s ability to stay aware as she paddled. Howson describes Eisert as a kid at heart whose humor keeps the training fun even when it’s grueling. “It can be hard at times, but at the end of the day, he’ll have fun and jokes around with you,” she said. The Laguna Beach High School junior has been back at school for two weeks now and just caught up with her school work. Although her teachers are able to send her off to competitions with assignments, it still takes her a while to catch up with her classmates.